What sort of coach do you want to be? With FA Learning providing 47 different football qualifications, it can at first appear a bit confusing where to start. Well, there are essentially two differing routes to become a football coach – it just depends on what you want to be and where you want to go. There is the traditional route of football coaching qualifications (to the centre of the diagram below), which progresses from Level One, Two and Three, building into the higher level UEFA A Licence and UEFA Pro Licence. The UEFA Pro Licence is the highest coaching qualification in the game, mandatory for all Premier League managers. 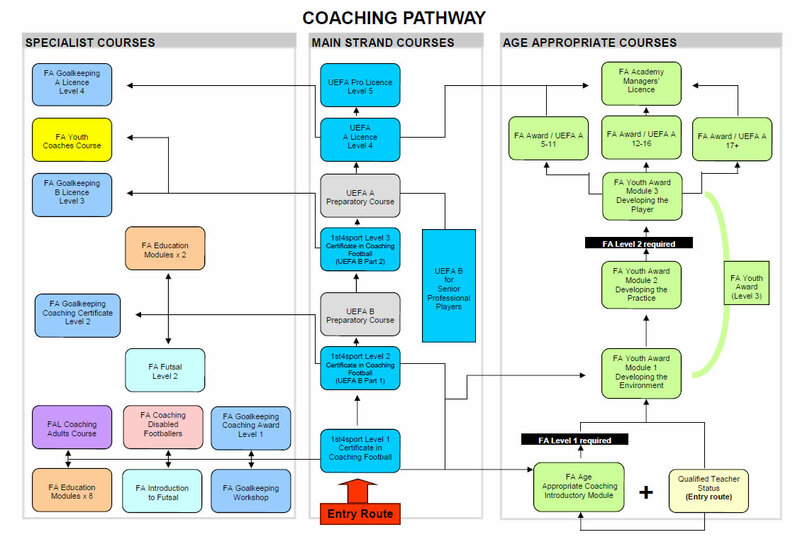 There is also the Youth Award pathway (to the right of the diagram), which focuses on a child-centred approach to football coaching. The innovative new look at coaching will create coaches who has an understanding of children and young players as well as football. On the left of the diagram are the more specialist option courses FA Learning runs, including courses for coaching goalkeepers and disabled footballers. Courses are held locally, at County FAs, and residential courses are held at a national level.